For generations, the Toyota Land Cruiser has been a leader in go-everywhere vehicles. Therefore, it was hardly surprising, given the success of the Cadillac Escalade (a tarted-up Chevy Tahoe) and Lincoln Navigator (an up-priced Ford Expedition), that eventually Lexus would outfit the Land Cruiser as a luxury-utility vehicle; nor was it surprising that their effort was more differentiated from the vehicle on which it was based than those of Cadillac and Lincoln. The Caddy's changes were almost entirely on the outside and on the price sticker; ditto the Lincoln, whose interior seems less luxurious than minivans costing half the price. But the Lexus is unmistakeably a luxury vehicle on both the inside and outside, with higher quality interior fittings, more standard features, and a hefty dose of technology that maintains a higher standard of safety as well as luxury. Because the LX470 (the X is Lexus' SUV designator) is, at heart, a go-anywhere utility vehicle that can do without roads, the ride is not exactly what one would expect from a similarly priced Lexus car. Indeed, like the big Caddy and Lincoln, the ride is somewhat jouncy, though it is better at isolating bumps, cracks, and the like, and has automatically adjusting dampers that adapt to both smooth surfaces and off-road conditions. The active suspension, which controls shock absorber damping rates and ride height as well as the usual ABS/traction control and throttle control, helps cornering quite a bit, but can't change the character of the vehicle - it is quite heavy, and top-heavy at that, because it needs to be able to cross streams and ride over boulders. Like the Volkswagen Touareg, the LX470 has a height control which can be handy off-road; in addition to providing increased height at low speeds (it automatically lowers the body at speeds of over 30 mph to avoid rollovers), it can automatically raise the LX470 a little more than usual to get over a particular obstacle at very low speed. Unlike the Touareg, it does this automatically. There is also a lowering setting which brings the vehicle down by almost two inches to make exit and entry easier, but this is less likely to be used often since it takes a few moments to go into operation, and doesn't make a huge difference. It might be handy for loading especially heavy cargo. Off-road use also benefits from a fast-acting locking differential and other technologies delved into at depth in our Lexus Technology page. The active suspension seems to really help cornering, with the massive Lexus rounding curves at speeds far higher than it should be able to, devoid of the squealing tires that attract unwanted police attention. Loss of adhesion is marked more by a dignified growl than a high-pitched squeal. Generally, normal people will only hear that noise under emergency situations, since the LX handles ordinary roads so well. The heavy weight also dampens the powerful engine somewhat, though the 4.7 liter V8 (from which the LX gets the latter half of its name) is also designed to be less brute-force and more quiet-go-power through the throttle control and intelligent valve control. After all, the Lexus is a luxury vehicle and not a sports car; it is assumed that when the driver moshes down the pedal, they want to go forward but not to shock or jolt the passengers. Thus, acceleration is subtly dampened slightly for smoothness, which decreases the sensation of power. Horsepower is already moderate for the class at 235 (though it peaks at a relatively low 4,800 rpm), while torque is a hefty 320 lb-ft at 3,400 rpm. That said, the LX moves quickly and quietly enough for most people; 0-60 is estimated at 9.7 seconds, with a 17.5 second quarter mile. The engine burns cleanly, with low-emissions vehicle status in all 50 states, albeit with poor mileage: 2006 EPA estimates were 13 city, 17 highway, while our almost-exclusively city driving never broke 13. This is par for the course on this type of vehicle, but nothing to be proud of. 91 octane (premium) fuel is recommended, but ordinary regular can be used, with lower power and possibly lower mileage. 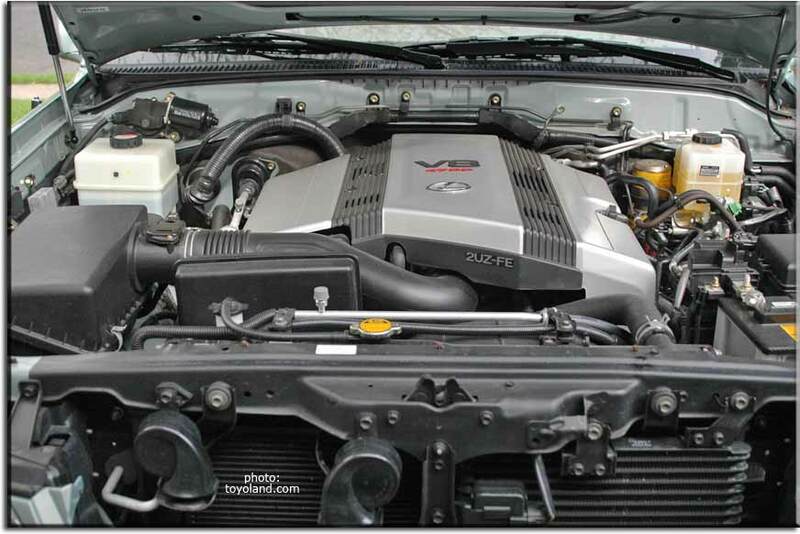 The 2007 GX, with the same engine but dual variable valve timing, managed to increase horsepower to 263 and torque to 323 pound-feet, increase acceleration so that 0-60 went from 9.7 to a quite-fleet 8.1 seconds; this was accomplished with the same five-speed automatic. Gas mileage actaully increased at the same time, to 15 city, 19 highway, a bit more respectable. The transmission is always smooth, aided by fly-by-wire torque management, even when making kickdown shifts; yet it nearly always chooses the right gear for the job without hunting. Sport and low-traction modes (which starts out in second gear) are available at the press of a button. Individual gears can also be chosen by moving the shifter further along the gate. Full-time four wheel drive is standard, as is a two-speed transfer case and mechanical locking center differential. 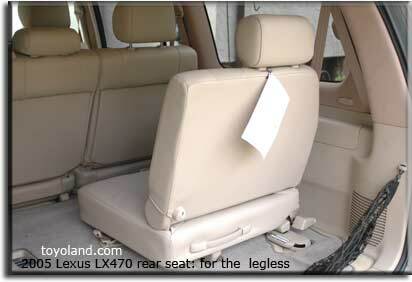 Aside from off-road use, the LX-470 shines in the interior amenities. While the Volkswagen Touareg emphasizes on-road performance, the LX has a strong off-road pedigree; but on-road, performance is less than stellar, while the interior is quite nice and shows much more thought than the troublesome Touareg (we're not even going to delve into reliability, where Lexus seems to beat all comers easily, and dominates German makes with hardly a second thought.) 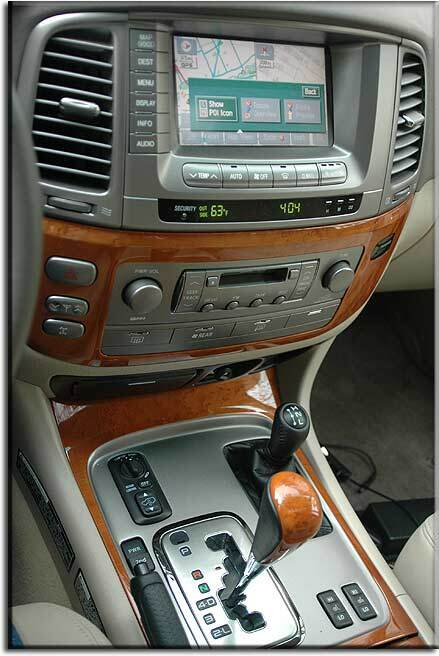 The interior trim is real wood - and a type of wood that's fairly rare in the United States, at that (since the LX-470 is made in Japan, we suspect they get the wood from China, where it's more common). The wood trim includes the steering wheel and is generously applied across the dashboard for a good sense of luxury which does not disappear in the back of the truck. Careful use of chrome also adds to the effect, along with a nice quality light tan leather and matching carpet and plastic panels. Interior technology almost matches the safety and drivetrain technology, with a well-integrated navigation system, rear-view camera (for vehicles with the rear DVD system), built-in telephone and voice command system, rear climate control and audio, and more. Seating is a little less refined, with rear passengers riding side by side in fold-up seats that are less than perfectly useful - they are little more than cushions sitting on the floor, and take some effort to unfold and put back into place, with a slide as well as two folds. 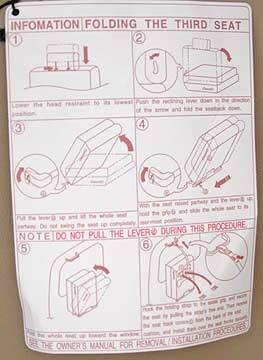 Instructions, albeit mis-spelled and oddly translated, are provided near the seats for convenience. Ignoring safety information that indicates that the safest vehicles are minivans, many parents buy large SUVs to transport their children. The LX 470 may not be a good choice for this, despite its safety technologies, because the LATCH system child-restraint loops for only one rear seating position - behind the driver rather than behind the passenger, which is odd because the passenger position is safer (since the child is loaded or unloaded from the curb rather than from the street). LATCH is the best way in North America to attach child seats (other than integrated child seats, which cannot be used for infants). Getting back to the front of the vehicle, the instrument panel has a classy though modern motif of brightly backlit white numbers and dials with the two central gauges surrounded by bright chrome rings. 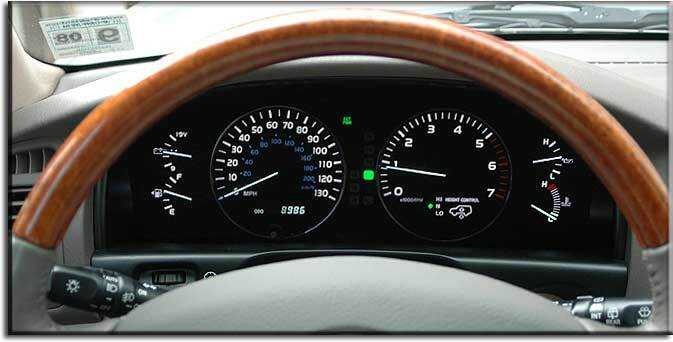 The speedometer goes up to 130 mph, but the 0-70 range used by most people is clear and large enough. Other indicators are present for voltage, gas level, oil pressure, temperature, and height control status (almost always set to N); the backlighting goes on and off gradually with an opera dimming effect. Beneath the instrument panel on the left is a panel with the rear-view mirror in/out button (to immediately fold in the outside mirrors with a single press), mirror adjustments, rear vent window open/close controls, and, oddly, the shutoff for the RSCA system. To the right is the ignition key, set into the dashboard for convenience and visibility. Headlight and wiper controls are on stalks, along with the cruise control, in intelligent and standard configurations. There is no single-wipe mode, but there is an automatic rain-sensing wiper position with a more/less often frequency control. The steering wheel both tilts and telescopes via an easily used electrical switch. The wide center console that rides on the transmission hump contains a few apparently randomly-placed controls, including the four wheel drive high/neutral/low stick - unusually easy to move - along with the height control, damper control (to soften the ride or make it sportier), transmission option buttons (power model and start-in-second), the shifter itself, and the seat warmers. The shifter allows manual selection of each and every gear, without resorting to a seldom-used manumatic mode. The power mode can be left in place permanently, while the start-in-second can only be used once and then needs to be reset (you wouldn't want to forget leaving it in place); power mode is rather nice, bringing more rapid acceleration without additional noise or harshness. The comfort/sport setting is best left in manual, since the system adjusts itself anyway. The center stack is contoured to avoid a cheap appearance, with one effect being the need to only use Lexus stereos (no aftermarket units - though very few people would say one is needed, especially with the Mark Levinson stereo option). The hazard lights and differential locking controls are to the left of the stereo, along with an unusual feature - an antenna height control. 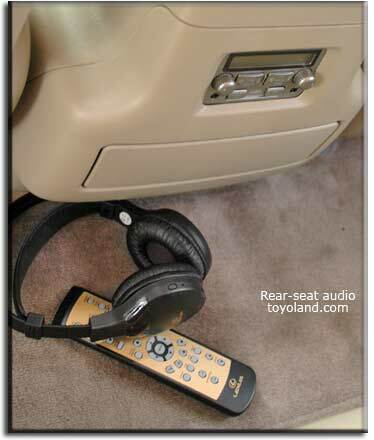 The antenna automatically comes out or retracts, but the height control allows the driver to lock in a specific height that might be best for one station, band, or area; that height is remembered when the stereo is shut off (or a CD is put in). The standard navigation system (despite what you may read in the owner's manual, it does appear to be standard) is well integrated to a degree, though since it is standard, we'd hope that you could set vehicle preferences such as locking behavior with it, instead of having to go through esoteric movements described in the owner's manual. The functions include a few trip computer items (gas mileage, speed since restart, distance to empty, distance since restart) all on one page, a maintenance log, phone book, and calendar, as well as the usual map features; it also integrates some audio and climate controls. What's interesting about the latter is the fact that there are both physical buttons and LCD screen controls for audio and climate, which can be a little confusing at first. The stereo, fortunately, uses large buttons for tuning, volume, mode, and such; but bass, midrange, treble, balance, and automatic loudness control are all set from the LCD screen. The LCD is also used for seeing disc and track titles, and selecting which CD or DVD to read from the changer at the bottom of the covered center console. The stereo sound itself has excellent separation and excels mainly in the high quality sound delivered to both the front seats and the middle row. It does not emphasize bass or treble but seems fairly accurate, both at standstill and at speed. The climate control's physical buttons are for temparature, automatic on, fan off, defroster, and intake (fresh air or recirculation); oddly, the button used to get more options from the LCD screen is not with the other LCD screen buttons to the left of the screen, nor on the extreme right or left of the climate buttons, but is instead placed second from the right. Pressing it brings up the fan control and the vent mode. The fan is powerful but never gets especially noisy; a vent under the steering wheel is somewhat unusual but helps increase the effectiveness of the air conditioner. The navigation system is faster than most competing systems, and because all regions are on a single DVD, you never have to change discs. It operates (like the audio and climate controls) via touch-screen, which is easier than some other systems that use a spin-and-press button. Destinations can be entered by map, longitude and latitude coordinates, intersection, freeway exit, address, name, category, emergency, memory, phone number, or previous selection. It's easy to enter destinations because the system provides a standard keyboard, and all the keys stay in the same place; you just have to be patient as you type, and, of course, you have to know how to type (or do a lot of hunt-and-pecking). The system has some special features which are discussed in our Lexus Technology page; one of the more useful aside from the realistic cityscapes is the split screen, which allows two different views to be shown at once, with different orientations (driver up and North up) and zooms. Getting used to the system takes some time, as some items are not quite as intuitive as they could be, but it's powerful and relatively fast. The navigation system includes an important safety feature, a rear view camera that automatically goes on when reverse is engaged. Considering how many injuries and deaths occur from people backing up huge vehicles, not to mention the difficulty of parking such a large vehicle, this is an extremely useful safety feature; you may well avoid causing death or injury to one you love. The rear view camera provides a wide-angle view from the back of the vehicle, making visibility better than in most sedans, as well as just about any SUV. Small conveniences abound; the sun visors include a ticket holder and are the dual-part kind with a large main sun visor and a smaller one for those times when you're on a road that turns periodically (the visors can both be used at once, one on the side window and one on the windshield). The center console has two compartments, a big one that also contains the CD cartridge (there is no slot-loader) and a shallower one which also has a hidden fold-apart extra pair of cupholders, in case the normal front cupholders aren't enough. Front and rear seats both have map pockets, which is good since there is almost no room in the glove compartment with the fat owner's manuals in there, and there is an overhead sunglass holder; there is not only an ashtray but a cigarette lighter, power outlet in the dash, and power outlet in the center console. The standard sunroof is quite large and has separate tilt and slide controls, with the slide control having one-touch open and closing; the power windows are all express as well, with a single touch opening or closing them all the way. On hot days, you can open all the windows with the remote control at a distance (though we weren't able to close them that way; but you can also open or close them by holding the key in the lock). The middle seats fold and flip; the rearmost seats, as we've noted, have to be flipped twice, then slid along a bar, then tied in place. The rear passengers have their own stereo controls and, with the rear navigation system, their own headphones; rearmost passengers also have their own cliamte control. Oddly, middle-row passengers do not appear to have their own cupholders.Another oddity is the sheer volume of large black warning labels, which appear to be attached to nearly every surface, from the driver's door to the rear passenger door. Middle seat room is generous, as is headroom throughout the vehicle; the cargo bay is somewhat limited by the rear seats, though. Our vehicle had the $2,469 rear entertainment system, which is essentially a DVD player with game/other inputs; the screen folds down from the roof. The instructions told us that there was a DVD slot in the system, but it wasn't there, and DVDs put into the CD/DVD cartridge up front were ignored. 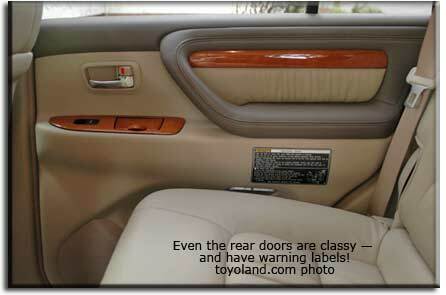 The Web site wasn't helpful either; we finally found a DVD slot hiding behind the rearmost seat on the passenger side. The seat had to be put into place to put a DVD in; after that, the system worked nicely, with a good remote that includes on-demand backlighting for night use. The screen, as with all roof-mounted units, puts a dent in rearward visibility, but it isn't as big a dent as most; you can still see beneath it. The Lexus LX 470 starts at $64,775, plus $625 destination. That includes some features we haven't talked about yet - a variety of safety controls, fog lamps, rear wiper, tool and first aid kits, leather, driver seat memory, smog sensor and air filter, steering wheel telephone and audio controls, voice command system, illuminated running boards, and universal garage door opener. Our test vehicle also had the Mark Levinson audio upgrade at a cool $1,280; a roof rack at $220; a cargo mat, cargo net, and wheel locks for a mere $232; a spare tire lock at $71; and the aforementioned video system at $2,469, bringing the grand total to $69,972. That's rather a lot - we'd much rather have a Lexus LS or GS if we're going to be spending that much - but if you compare the LX to Cadillac's Escalade or Lincoln's Navigator, you'll be surprised at how reasonable it can be. After all, neither the Caddy nor the Lincoln have Lexus' reputation for quality and reliability, nor the LX470's offroad capacity, nor its cornering and handling; neither provide an interior in the same class; and neither provide the same safety features or conveniences. The Land Rovers and Range Rovers are fun if you have your own full-time mechanic, but with their past showings in quality surveys from various groups, we really can't recommend even looking at them. The Volkswagen Touareg/Porsche Cayenne is an attractive competitor, but a large number of quality and usability glitches make them difficult to recommend as well. The Lexus LX470 is not for everyone - the gas mileage is appalling, the ride relatively trucky, some of the everyday features a bit awkwardly implemented, the rear seats designed for emergency use only - but if you're bound and determined to get a full sized luxury truck instead of a more sensible minivan or sedan, it's the best in its class.